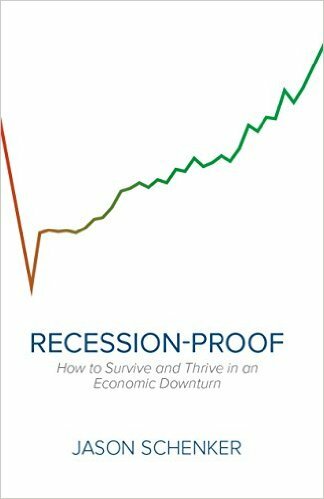 Does the thought of a recession spook you? Are memories of the last economic downturn in the wake of the US subprime mortgage crisis fairly raw? It might well be hard to avoid an economic downturn, but your chances of escaping unscathed and managing the situation depend on your tenacity and desire to rethink life as you know it, according to economist Jason Schenker. Hammering home this central theme is his book – Recession-Proof: How to Survive and Thrive in an Economic Downturn released earlier this year by Lioncrest Publishing – which makes you sit up and take notice of both the obvious and the not so obvious when it comes to your career, investment and lifestyle choices versus the evolving macroeconomic climate. The engaging tone of Schenker’s work spread out over 200 pages split by 11 chapters stands out. The book is full of practical suggestions, a pragmatic dose of stating of what’s evident (which some of us tend to ignore at our peril), a gentle nudge towards constructive soul searching and last, but not the least, one of the most refreshing elucidation of SWOT (strengths, weaknesses, opportunities, and threats) analysis that the Oilholic has read in recent years. And being prepared for all eventualities is what is required in this day and age of turbulence where fear and greed are seen to be driving markets, Schenker adds. Instead of feeling sorry in the event of a recession be bold, or better still spot economic turbulence before its hits your company, life and finances, all three of which are intertwined in more ways than one. Schenker explains how he went about staying more than just afloat in previous downturns, and how you can too. All chapters are fascinating, but if the Oilholic was asked to pick his favourite passages, one would say Chapters Two (What does your personal recession look like? ), Five (Dig In) and Seven (Run) would be among the most riveting ones. This book is not some run-of-the-mill self-help guide. Rather parts of it might well jolt you into action. But perhaps that’s the jolt you need in life to be recession proof and the lessons Schenker learnt from challenges in his own life that form part of the subject matter strike a chord. In the spirit of full disclosure, the Oilholic has known Schenker in a professional capacity for over ten years, since his days at Wachovia and one’s own at a CNBC Europe production team; and can personally testify that he never sits on the fence in any deliberation of any sort whether we’re discussing central banks, forex or OPEC's oil production quota. His knack for plain-speaking is reflected in the narrative of the title. But Schenker’s book appeals to this blogger not because he’s an old friend, but because his work makes one sit up and take notice of things we often subconsciously ignore whether it comes to career or investment choices or for that matter which industry conference to attend! The Oilholic is happy to recommend this title to the young and old alike, those starting out in professional life to those looking forward to retirement. Recession Proof, for this blogger at least, transcends a typical readership profile. This book is not only about financial survival, it’s not only about career security, not just about investment management; rather it’s about all of the above, along with the right dosage of prudence and practical advice from an old industry pro sprinkled in for good measure. Everyone could do with that!